Today and yesterday there have been these gorgeous rainbow sightings in the sky. 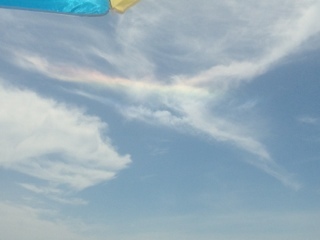 Yesterday it appeared to be a rainbow stripe across the sky. Today was a halo completely around the sun that had an iridescent rainbow effect to it. At first I was freaked out. Wondered what was going on that would cause these. Then I realize it’s just my mom. Saying hello. Telling me to relax, have fun, and enjoy life. The halo around the sun today especially clued me in on her little plan to tell me she was here. I wish I could have gotten a picture but nothing quite turned out. I don’t think it was something that was to be captured on film. Just a moment for me in the gorgeous Florida sun. Just a moment for me to remember she’s always with me. Just a moment to remember that through all the pain and grieving there’s always hope for a better day. Just a halo in the sky. Her halo. So neat! I am glad you are having such a wonderful time! Way to start your summer! ok not going to lie but half of your blogs make me want to cry! Ok not make me but.. cry! Love you!